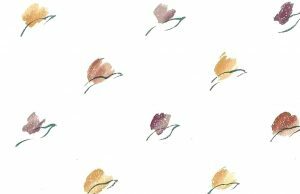 Vintage tulips Wallpaper Border with a charming Americana pattern including Navy, Yellow and Deep Red (almost Cranberry) color stylized tulip-like flowers on Green vines with Deep Red hearts. The top and bottom of the border have narrow Deep Red bands. Ideal for a Kitchen or Breakfast Room.